By James W. Fatherree, M. Sc. 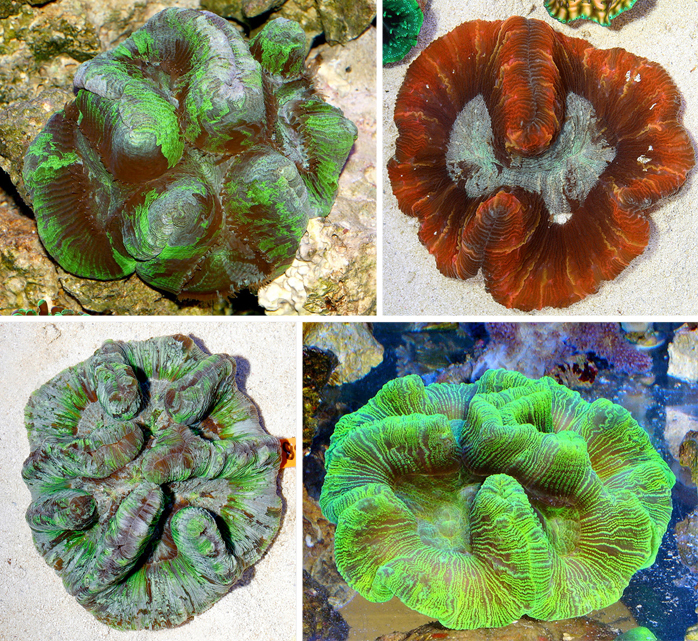 One of the most common corals offered to reef aquarists is the open brain coral, Trachyphyllia geoffroyi, which is an exceptionally hardy species. These most commonly come in various mixes of fluorescent shades of green and red, with some being almost entirely green, others being almost entirely red, and many that are something in between. And, when it comes to common names, specimens that are predominantly green are accordingly called green open brains, while those that are predominantly red are called red open brains. They can also come in shades and mixes of brownish, pinkish, or even bluish, colors, as well. So, most of them are quite attractive. Here are a few examples of the most common form. They usually look something like a figure-eight. Specimens often have a skeleton with a cone-shaped base, which typically develops into something of a figure-eight shape as they get bigger. However, they can sometimes come in other forms, being perfectly round to very elongated, and may even have more of a clover-leaf or convoluted shape with several prominent lobes. So, you can see that there can actually be a good deal of variability in their appearances. With that in mind, I have to also point out that round specimens with a flat bottom are often incorrectly called Wellsophyllia radiata, the Pacific rose coral, but this less common open brain is actually just another form of T. geoffroyi. In the past, it was thought that the two corals were not just separate species, but were actually members of two separate genera, Trachyphyllia and Wellsophyllia. However, coral experts eventually decided that these apparently different corals really weren’t that different after all, so the name Wellsophyllia radiata is no more. In fact, if you look in older coral biology/identification books you’ll find both of them, and even Trachyphyllia radiata, but not in any more recent ones, such as Veron (2000). 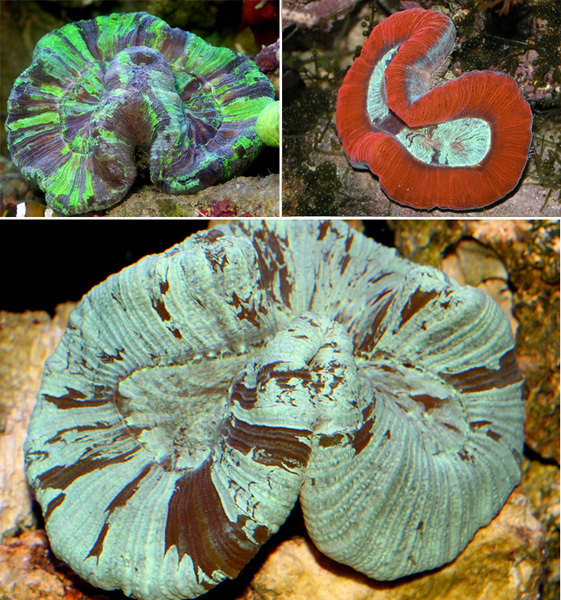 So, for several years now they’ve all been called Trachyphyllia geoffroyi, and are apparently nothing more than different looking forms of the same coral, which are referred to as morphotypes (morph means “shape” or “form”). I still see specimens being offered as wellsophyllia on a regular basis anyway. Here are a few examples of what used to be called Wellsophyllia radiata, but is now know to be a particular form of Trachyphyllia geoffroyi. Regardless, I’ll call all of them open brain corals from here on out, will correct a couple of other inaccuracies, and give you some care and shopping information, too. Note that there’s no difference in care requirements, etc. for T. geoffroyi and the ex-Wellsophyllia radiata as it has also been observed that both of these corals are sometimes found living side by side in the same environment (Borneman, 2002). For the longest time it was thought that the different color schemes of these corals had something to do with the differences in environmental conditions where they lived. The bright green varieties were supposedly collected in shallower waters, with the prevalence of green pigments being an adaptation to living under bright sunlight. Conversely, the red specimens supposedly lived at greater depths and/or cloudier waters, where light intensity is decreased. It is true that specimens are found in a wide range of environments, but as it turns out, most of them (at least those coming from Indonesia) are actually collected at depths of around 100 feet, which is fairly deep for corals. In addition, green open brains and red open brains can also be found living side by side in some of these environments where they are collected, under identical conditions (Borneman 2002). This obviously negates the idea that green specimens live under bright light while red ones live under less. Apparently they can both do just fine under the same conditions, and the notion that a hobbyist must provide more light for a green specimen than a red one is now defunct. Really, as best as I can tell they can all do well under any lighting system that would be considered suitable for keeping any corals. They aren’t picky at all. However, the one thing I do have to steer you away from for sure is the possibility of “light-shocking” a specimen upon introduction to your tank. Any of them can thrive under intense lighting if given an extended adjustment period, but you never want to buy one and then immediately place it right under a metal halide lamp, or anything else of similar intensity. Instead, you should keep a specimen under dimmer conditions and slowly give them time to adapt to brighter light. This can be done by simply placing them at the bottom of a deeper tank and then moving them up higher in steps over a couple of weeks if you choose to keep one off the bottom. Or, you can use a few sheets of screening material placed between the lights and the coral to block out some of the light, and then remove the sheets one at a time to slowly increase the amount of light that hits the coral. Here are a few examples of other forms this species can develop. Some are round, especially when small, some look like clovers, some look like figure-eights, etc. It’s also obvious that they can have a good range of color patterns, too. Another myth is that open brain corals must be placed on a sandy or even muddy substrate. This is indeed what they are typically found living on in the wild, but that doesn’t mean it’s required in tanks. For several years in the early 90’s when I was first getting into reef aquariums, I only set tanks up with bare bottoms and live rock. So did essentially every other reef keeper in the hobby. So, there was no sandy substrate in use, and certainly no muddy ones. However, during those same years, hobbyists were able to keep open brains directly on the glass bottoms of tanks or placed on the live rock without any substrate issues. Regardless of where they’re found in the wild, they seem to be able to thrive in tanks regardless of what they are placed on, as long as other conditions are satisfactory. Still, if you do have a sand-covered bottom (all of my tanks do these days), I’d say put an open brain on it anyway to better mimic their natural occurrence. Okay, so lighting is flexible and the substrate is flexible, but one thing I can tell you for sure is that open brains do not like being blasted by a strong current. They will not expand their fleshy tissues if it’s too strong, and could even be injured. Their skeletons actually have numerous thin, blade-like ridges on them, and they can expand their soft fleshy bodies to such a degree that any really strong currents could actually cause them to cut their own tissues on their skeleton. So, you should be sure to that water does move over and around them in a tank, but not to the point that they keep their flesh retracted into their skeleton for fear of being ripped up. It’s a given that water quality should be up to par, but one thing you might not think of is giving an open brain a good meal every once in a while. Providing them with an occasional serving of some appropriate meaty food (like brine shrimp, small bits of clam meat, etc.) will bring on their feeding responses, and can be pretty neat to watch. Giving them food let’s you see how different they can look at times, which is something you probably won’t ever see unless you hand feed them. Of course, it can help to ensure that they’re getting all the nutrients they need, too. The easiest way to do this is to turn off all the pumps, filters, etc. and then use a big syringe (without the needle) or a turkey baster to squirt a very small shot of food or even just some of the water carrying its odor over a coral’s body, near the mouth(s). Then, after a few minutes the coral will react when it detects the presence of food in the area. The mouth(s) will go from being a small slit to what looks like swollen, puckered lips. 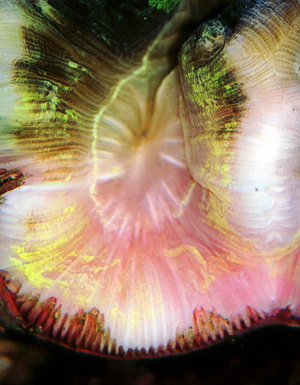 The short feeding tentacles, which are usually hidden under a flap of tissue will also extend in an effort to capture any food bits that come their way. Once prepared, you can use the syringe or baster to squirt more food onto their tentacles and watch them slowly grab and ingest whatever is offered. This may sound like a bit of a hassle, but these corals eat so slowly that you’d be amazed that they manage in the wild, as it can take up to several minutes for them to completely ingest even small bits of food like a few brine shrimp. A common question on this topic is how often you should feed an open brain coral, and that’s not an easy one to answer. Some folks say they need to be fed several times a week, others say a couple of times a week, and some say they only need to be fed every once in a while. I think it’s really going to depend on the environment they’re in for the most part. If a specimen is getting lots of light, it won’t be as dependent on other food sources. Conversely, if the lights are dimmer, it’ll likely need more food. If it’s in a bare-bottom tank with no sort of food being added, it’ll likely need to be feed more. Or, if it’s in a tank that’s set up with a food-producing deep sand bed, it may get all the food it needs without any extra help from you. Thus, you’ll have to be the judge of what is required as a minimum, depending on your own situation. They do like to eat though, regardless of the situation, so even if they are getting everything they need to survive without your assistance, I still say offer them something now and then. If for no other reason, it’s neat to watch. Conversely, if you are feeding frequently and start overdoing it they’ll simply reject the food and/or will spit out nasty looking gobs of mucus and undigested food later. So, if you pay attention and keep a good watch on a specimen long enough, you should be able to figure out how much to provide it and how often. These corals do have feeding tentacles, which will emerge when they detect food in the water. Their mouth(s) will go from being a slit to what looks like odd puckered lips, too. All right, now for some shopping tips, and a bit about their health issues. 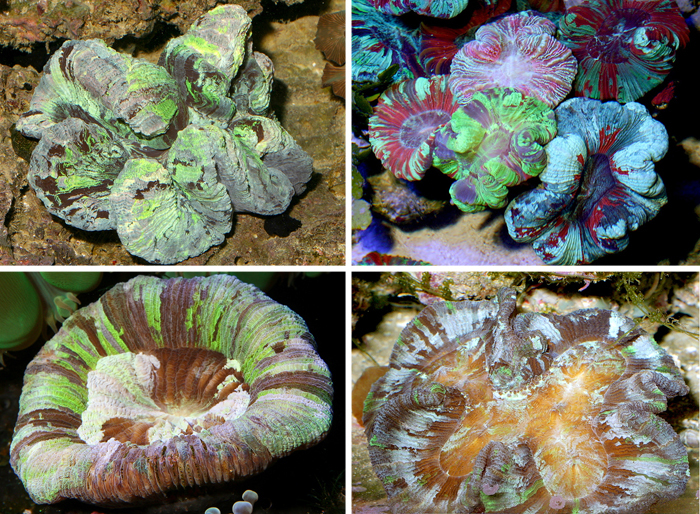 When it comes to things to watch out for when shopping, open brain corals sometimes suffer from a few problems that commonly affect many other sorts of stony corals. As is the case with other particularly fleshy corals, the first thing to look for is good expansion. While shopping, if you come across an open brain that is tightly retracted into its skeleton, pass it up, as it may be unhappy for some reason. It doesn’t necessarily mean it will die, but you should go for another specimen that looks better and is well-expanded if possible. A failure to expand can be something of a riddle at times when it comes to open brains though, as they’ve been known to look very healthy for long periods and then just stop expanding one day. Sometimes it may be due to a sudden change in lighting intensity, like moving them from the wild to the store to your tank, or changing your bulbs. However, at other times it may be related to adding a new coral to your tank that gives of noxious chemicals, or it may be related to nothing you can put your finger on at all. If this happens in your tank, the best thing you can do is try to figure out what may have changed and then correct the situation. I’ll warn you though that sometimes nothing seems to work at all, and a specimen won’t respond to anything you may try. Fortunately, if all conditions are suitable, eventually they typically “recover” fully though, again without any obvious reason. Lastly, we get to tissue damage and recession. As mentioned, open brain corals have sharp ridges on their skeletons, and when specimens are shipped from place to place they sometimes get damaged in the process when the tissue rubs and bumps against these ridges. This can happen even when a specimen’s tissue is fully retracted, too. So, keep a sharp look out for any apparent damage to the fleshy part of a specimen before buying one. If the tissue is damaged in such a way, it will oftentimes begin to recede and sort of rot and or peel away from the area of the injury. In bad cases, this can eventually lead to the death of a specimen, although if kept under good conditions it oftentimes is reversible. Unfortunately, this sort of tissue recession can also happen at other times, when there has been no physical injury to a coral. While the exact cause isn’t known, my guess is that it’s a reaction to poor water quality and/or a lack of nutrients. If it happens, be sure to check your water quality. Calcium and alkalinity may need adjustment and/or phosphate concentrations may be high enough to inhibit growth, etc. Be sure you are providing enough light and/or food, too, and hope for the best. Here’s a specimen showing two problems. First, it’s suffering from bleaching, which can be seen as the loss of color. And, it also has some damaged tissue at its margin, leaving some of the ridges on its skeleton exposed. Despite these issues, open brain corals are categorically some of the hardiest corals you can choose from, and they’re usually quite attractive, too. So, I still highly recommend them to anyone that has adequate lighting and good water quality. I think I’ve had at least one in every reef tank I’ve ever owned or set up for someone else. References Borneman, E. H. 2002. Do you know where your corals are coming from? Ecological information for aquarists from coral collection areas in Indonesia. Advanced Aquarist’s Online Magazine:www.advancedaquarist.com/issues/mar2002/feature.htm Borneman, E. H. 2002. Personal communication. Veron, J. E. N. 2000. Corals of the World. Australian Institute of Marine Science, Townsville, Australia. v.3, p.270-273.